Tickle your taste buds while enjoying the sweet pleasures of paradise. Savour flavourful local cuisine, as well as delicacies from around the globe at Veligandu – home to some of the best restaurants in the Maldives. At our main restaurant, Dhonveli, you can enjoy an abundance of tastes. A rich display of culinary delights awaits at the buffet during breakfast, lunch, and dinner. Our popular à la carte restaurant, Madivaru, offers a fine dining menu, full of mouth-watering specialities, spiced up with mesmerising lagoon views. Relaxed afternoons or chilled evenings are best spent with a refreshing drink in hand at one of our bars. Private meals may also be arranged upon request, al fresco, at a beach spot of your choosing or in the comfort of your villa. Enjoy all-you-can-eat buffet style meals for breakfast, lunch, and dinner at our main restaurant, Dhonveli. Madivaru Restaurant offers fresh grilled seafood, prime beef and other delicacies along with serene views of the shore. Indulge in luscious cocktails or a light snack in the lively casual atmosphere of our bars. Opt-in for our All Inclusive Plus package and enjoy excellent value for money and a seamless carefree holiday. 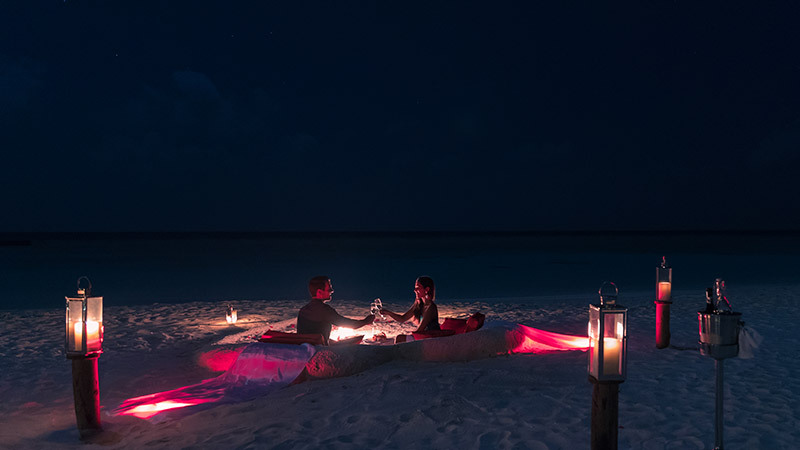 Relish a refined, 'toes-in-the-sand' al fresco dining experience under the stars. Stay in bed and enjoy the moment for just a little longer. Order a meal at your leisure in the comfort of your villa. It’s your turn to be the Chef or the Mixologist! Learn the intricacies of cooking and cocktail-making from the pros.